Liberty Four Patch Top finished! Yesterday I finished my top. As you see, it was quickly done and I really enjoyed playing with my floral fabrics. I find the most pleasant thing to work on simple patterns, like this Four Patch, to allow myself to concentrate on the association of prints and colors, and thus to achieve quickly a top, which is quite rewarding. As a matter of fact, what took the most time in this process was the choice and layout of my squares. 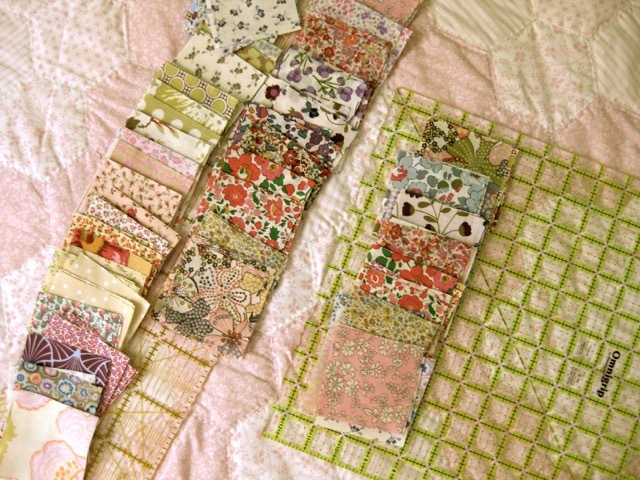 For my next quilt, I think of trying a more free exercise : a sort of random layout of my blocks. I know that it seems easy at first sight, but for me this kind of freedom appears to be one of the most difficult things in general, not only for quilting... I have a tendency to always want to arrange and match things, to create harmony. Rather than a tendency, I must admit that it can sometimes become an obsession! Youhouuuuu !! Tu travailles vite et bien !! Je n'y croyais pas en recevant la newsletter !!!! Il est super beau et annonce à grand renfort de fleurs le Printemps ! Soft and happy, truly charming. 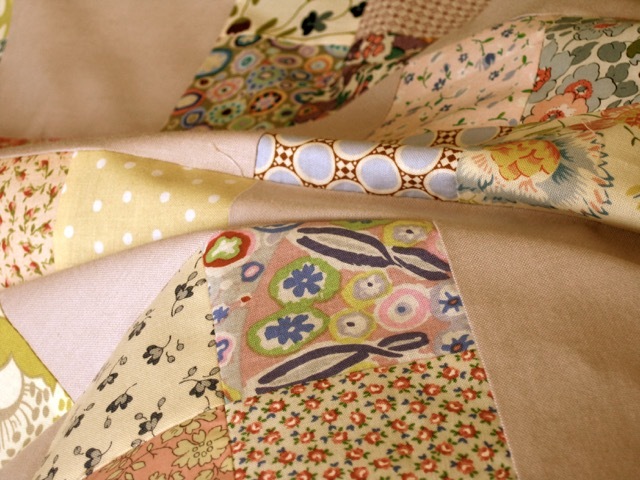 You have a gift for creating harmony out of an unlikely mix of fabrics. It's very entertaining to see all the different fabrics you've blended with such sophistication. The background color is perfect. Bravo! Ah cette Christine !!! Toujours surprenante...quelle fraicheur emane de ce joli quilt plein de romantisme ! !..Bravo une fois de plus !! So beautiful! 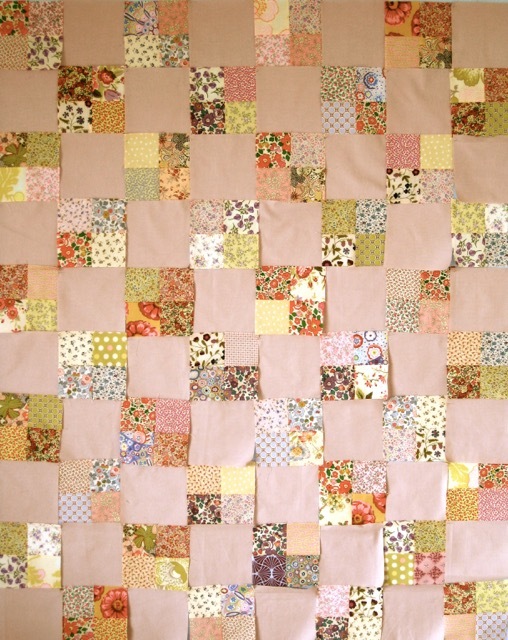 Thank you for the quilty inspiration! Un défi intéressant pour le prochain top... c'est si difficile de laisser faire le hasard! 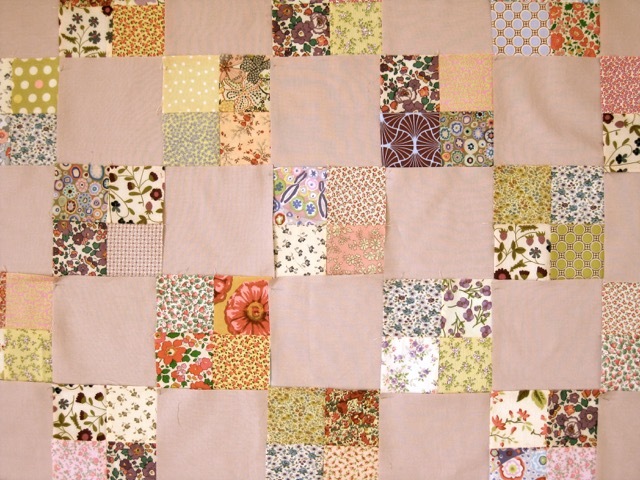 This is such a beautiful quilt, I love the look of your Liberty 4 patch blocks with the solid squares. 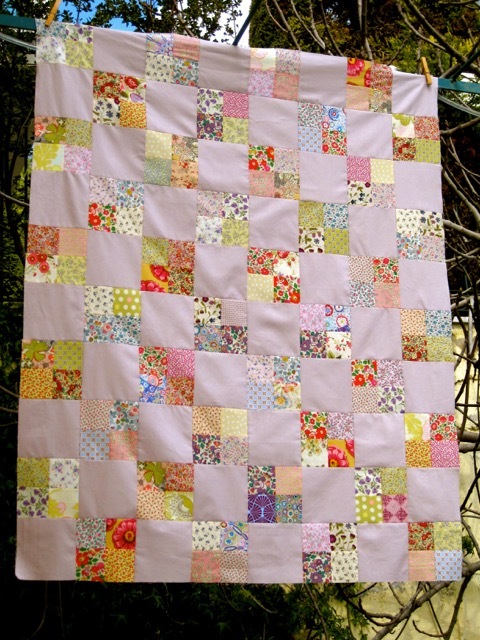 Beautiful soft, pastel quilt and I must say again that I love your mix of fabrics! No words really, Christine! This is so pretty and I adore the fabrics and choice of colors. J'imagine le casse-tête jubilatoire (oui, oui, ça va ensemble, tu es d'accord?) pour arranger les tissus! Tonquilt fait du bien en ce début de printemps. Bon courage pour la liberté :-) Je comprends tout à fait ton sentiment! 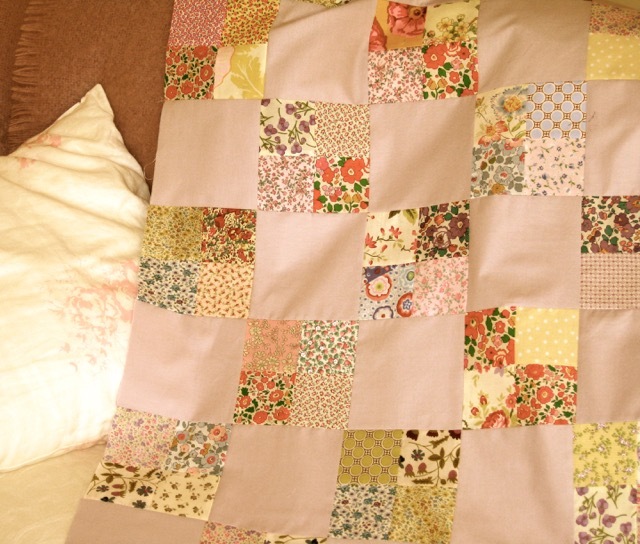 this pattern makes such good use of scraps I do not know how many over the years I have done. I love to make this pattern, You have nice fabrics. j'ai moi aussi des liberty mais dans des tons plus tristes ! Merci mamifleur! Le tissu est en fait plutôt un mauve rosé. What a charming quilt top. I love florals! I have a charm pack of Regent Street Lawns and am thinking this type of simple arrangement is the best way to use them! Oh this is so dreamy! I just love Liberty. That is so fresh and pretty! Congrats on finishing it. :) I can sympathise with the obsessive desire to arrange and sort, lol! 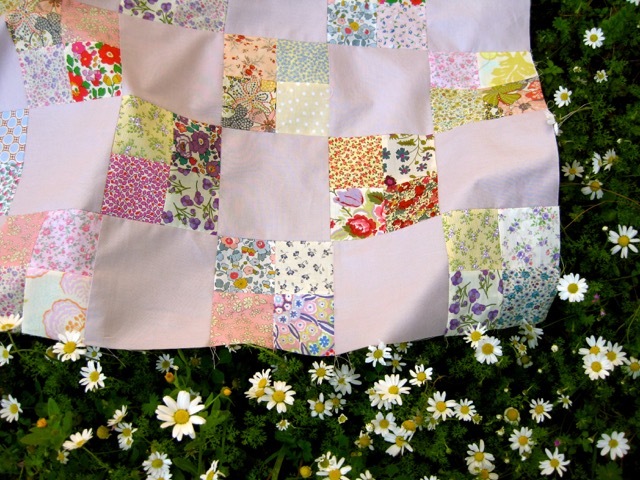 Your four patch quilts are a favourite of mine... and this one is no exception! Love the softness of those prints and pretty solid you chose for the alternate blocks. A really sweet little quilt top! Such a pretty quilt. I love it. Your calm, muted background is a great way to highlight your Liberty prints. This is lovely. Christine, I'm so honored you linked this beauty up to Pink Doxies Pet Project Show. 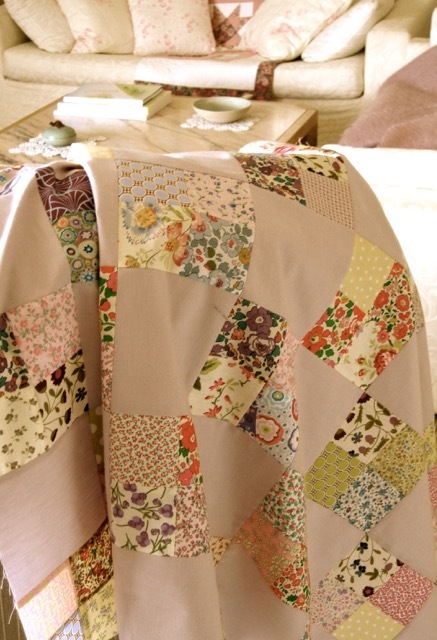 So glad I'm not the only one that struggles with 'random', my heart sinks when I see that word in instructions :-) Gorgeous quilt! I love, love, love, Liberty; this one is a true beauty! 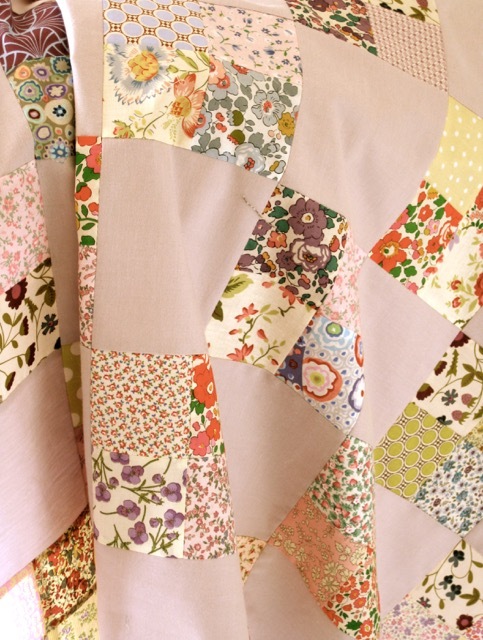 This is such a charming quilt top! The design really shows off your fabrics. I like your color selection. This is lovely. I really like the mauve-pink shade you chose as a background. Very , very charming! It is so beautiful in its simplicity.